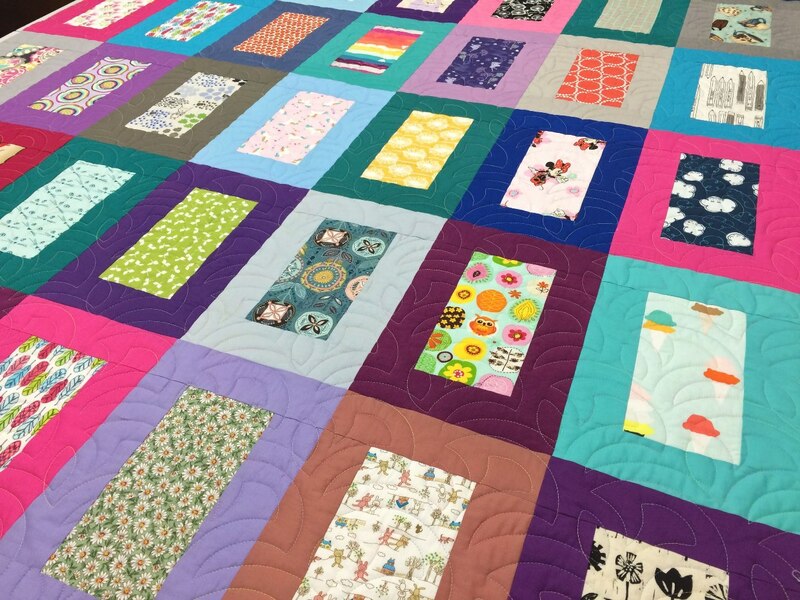 I have a quilt to share that I hope will make a teenage girl very happy who is living in foster care at the Miracle Hill Children's Home in the upstate of South Carolina. This photo was taken about three weeks ago when there were still leaves on the trees and some pretty colors. I assembled the top while I was at the Quilters of South Carolina retreat back in October and my friend, Mona, took some photos for me. The retreat took place at the White Oak Baptist Conference Center for the last time as we will be trying out a new venue next year. Here, the wind did not want to corporate but I wanted to show the grounds with the lake in the background. A friend in my guild, Michael Sullivan, quilted it for me using and all-over design, Moonflower. I was very pleased how it turned out. Finished quilt size, 56" x 72"
Thank yous go out to all of my Bee Inspired bee mates who generously made blocks for me. I had to make less than 10 of the 42 blocks. I asked them to choose any novelty print and frame them with solids in pink, purple, blue, aqua or gray. Their fabric combinations were thoughtfully chosen. There's a bunny watching out in the top left corner along with some feathers and flowers. And, some coffee cups... The leaves are full of color. There are even sock monkeys, cat faces and more flowers. And, bicycles, pencils and Mini Pearl bracelets. And, even some numbers and math equations. This photo is after the quilt was blocked and trimmed. For the binding, I chose a gray with a little pattern in it. I sewed it entirely by machine. I chose a Tula Pink print, Clear Skies, for the backing. I even did some pattern matching. The seam runs horizontal through the chartreuse circles. Can you find it? 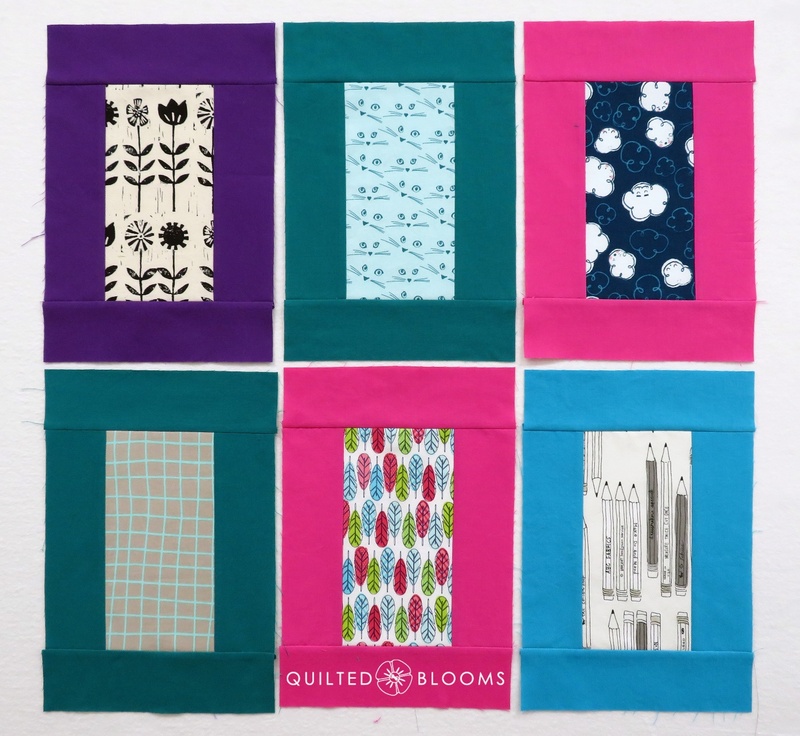 Here's what the backing looks like on the whole quilt. Well I did promise an I Spy block tutorial, so let's get to it! For the block center anything goes. You could use novelty prints, low volume prints, or anything that inspires you. For the frames or borders, I asked my bee makes to please use solids in the following colors: Pink, Purple, Blue, Aqua, and Gray - Feel free to use lights, mediums and darks in any shades or tones. My only prerequisite was that I would like for the fabrics to be prewashed. Prewashing is easy if you follow my tutorial for prewashing a small amount of fabric. (1) rectangle 4 1/2" x 8 1/2"
(4) rectangles 2 1/2" x 8 1/2"
1) Sew (1) framing rectangle to each of the long sides of the central rectangle. Press seams towards the framing fabric. 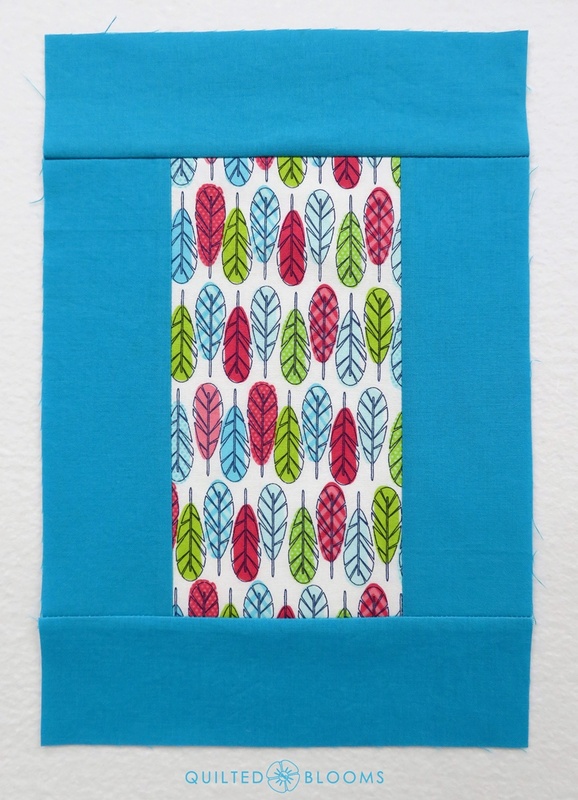 Tip: When sewing the framing rectangles onto the central rectangle, sew with the framing rectangles on the bottom. That way, if the central rectangle was cut on the lengthwise grain, the framing rectangles will have less opportunity to stretch as you are piecing. 2) Sew the remaining (2) rectangles to the top and bottom of the block and press the seams, again, toward the framing fabric. And, ta-da, you are done! Here are some I Spy blocks I made. 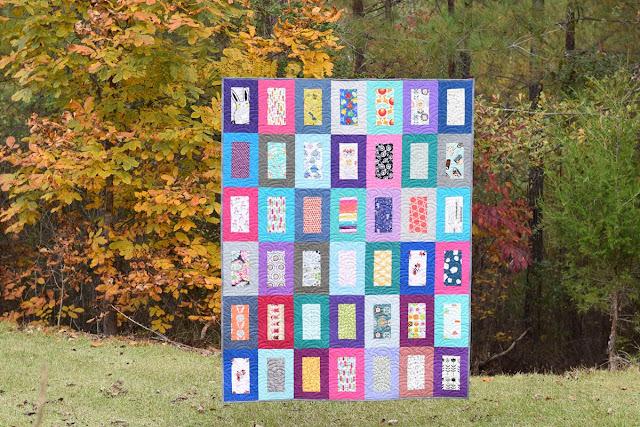 If you make some I Spy blocks, please share them on Instagram using the hashtag #TeenageISpyBlock and tag me @QuiltedBlooms. 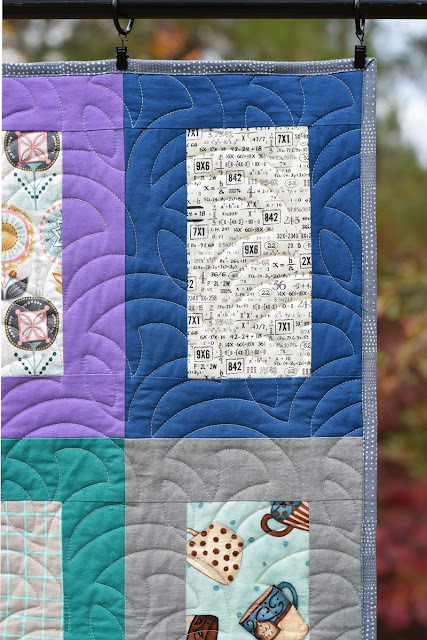 This I Spy block tutorial was originally posted by me on the Bee Inspired blog in March 2018. 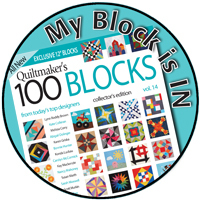 This rectangle block is used by permission from a fellow Greenville MQG member, Didi at DidiQuilts.com. 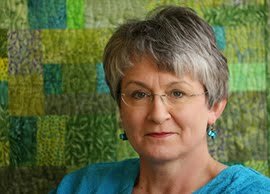 I'll be linking to final Finish It Up Friday as Amanda Jean from Crazy Mom Quilts made the announcement earlier this week that she is no longer going to run her inspiring blog as a business. Thanks Amanda Jean and I wish you all the best in whatever is next for you! You are never too old for a game of “I Spy”! Fun backing too! This is a great teenage version of an I Spy quilt Paige. I'm with you for the most part on the prewashing. I like your method for smaller items. What a fun quilt, Paige! I'm sure it will delight the recipient. 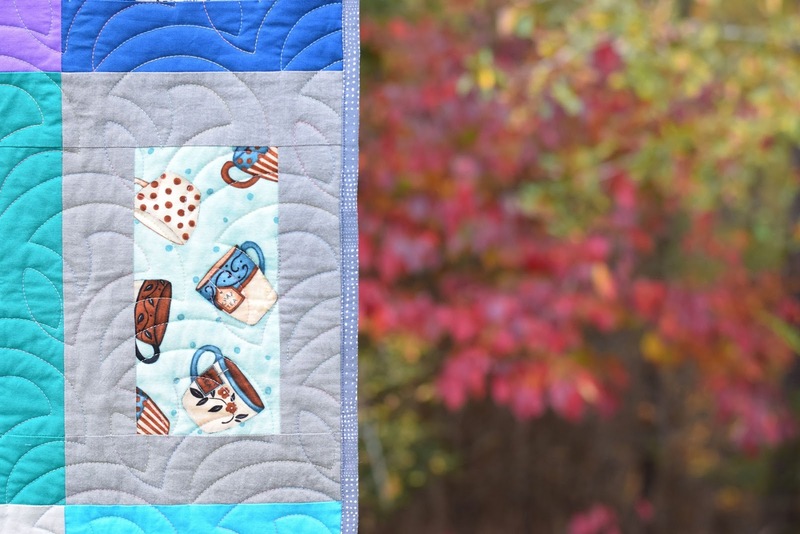 The quilting design really pops on that background fabric; so cool! 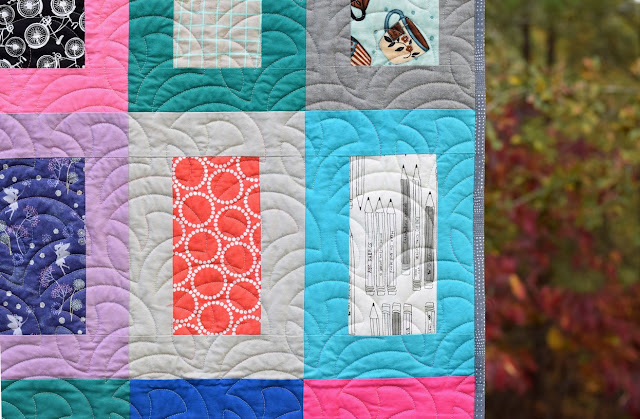 Fun to see the different blocks that were made for this quilt and all the novelty prints. I'm pretty sure this quilt will be loved!! It's so pretty. Love all the solid colors. They really bring the quilt to life! It's hard to use novelty prints, at least for me, but this was done to perfection! This is fantastic, Paige, and I love that your bee mates helped make this charity quilt a possibility. Your seam matching precision is amazing for the backing! What a fun quilt! I think the pattern is the perfect choice to show off the fun eye spy prints. Your matching skills are pretty awesome too! This is a beautiful quilt and I think it will be loved and appreciated by the recipient. The quilting is lovely. 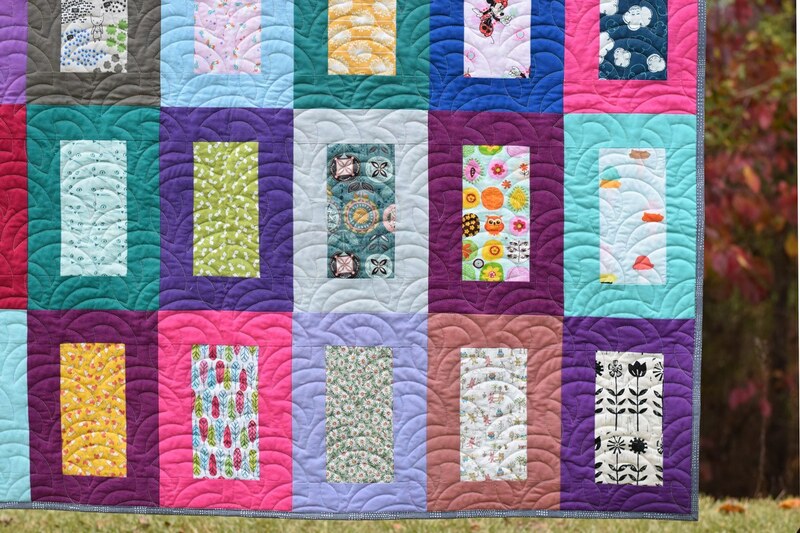 Having a set of instructions on fabric choices really helped to keep the blocks cohesive the quilt turned out lovely. The back is really great and the seamline is not noticeable. What a wonderful quilt! 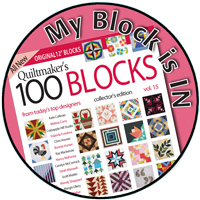 And the block is such a great one for bee/guild quilts! 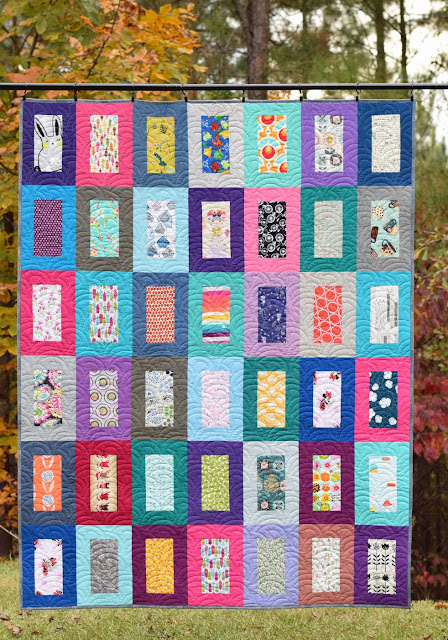 What a perfect teenage quilt! I had to really enlarge my screen to find your seam. Well done! Sewing the borders on the bottom is a great tip. Little things make a big difference. Thanks for sharing. 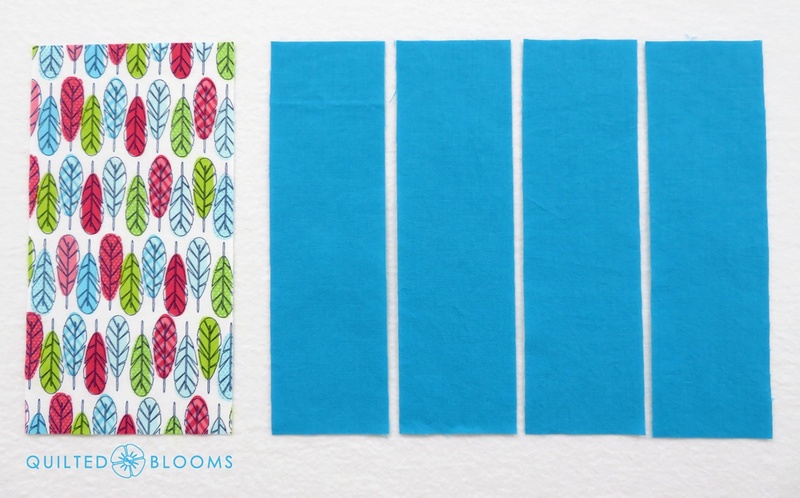 This is a great way to use novelty fabrics that are not babyish! Any young girl will love this quilt. Thanks, too, for the tutorial. Though I may have been able to duplicate it somewhat, the "real" instructions are always appreciated. I am pinning this one! Paige, this looks amazing!!!! I love all the blocks together, it really is a great color combination and you'd never know these were made by 12 different people! 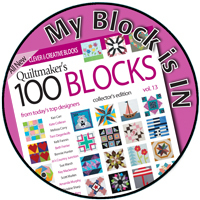 I found all my blocks, always the fun part of seeing a final Bee quilt :) And that quilting pattern really does look great. I hope the recipient loves it! You're so generous with your talent, Paige! This is a wonderful quilt that will surely be admired and loved by some young person. Not only a great design, and a tutorial to go with it, but you've impressed me again with the squareness of your quilt! 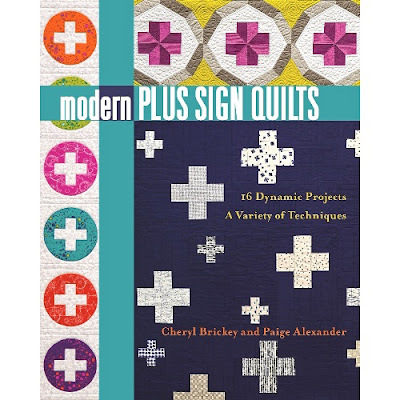 It think you need to do a tutorial on how you block and/or square-up a quilt for finishing. And your machine binding is impressive. After one attempt at it myself, I've never tried again. Wow. I've never seen a rectangle I Spy block. I like it and might give it a try. I love this I Spy block and am so happy that a young girl will get this. 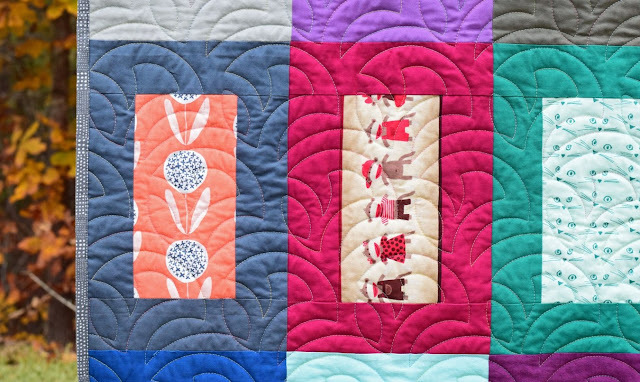 It is a joyful quilt. Hope you have a good venue for your next retreat. It is sometimes hard to change, but usually there is a benefit. It's such a happy quilt Paige ! Using rectangle shapes is a good idea. I love the backing you used as well ! 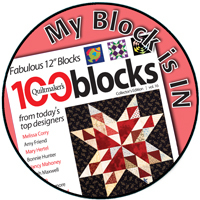 I love the way this turned out and like Emily I could find all my blocks :-) always exciting! 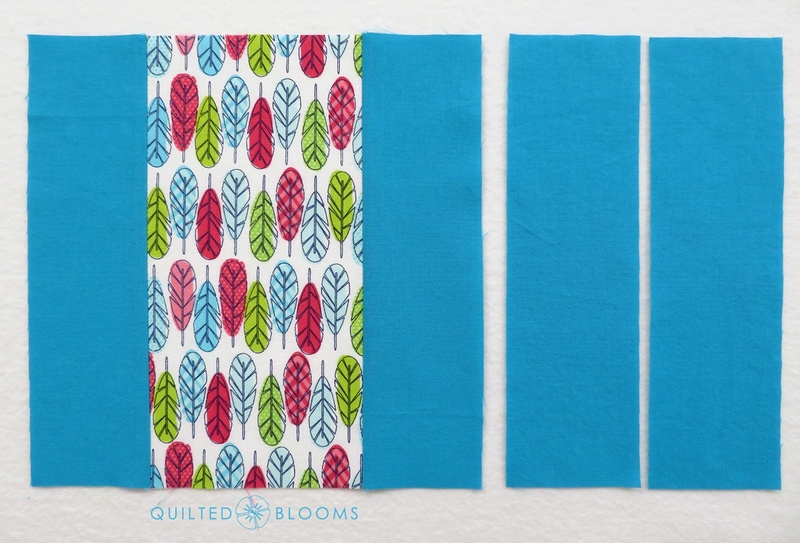 I love the quilting, it's perfect for this simple design. That wasn't the easiest fabric to pick for pattern matching but you've pulled it off perfectly! Congrats on finishing a bee quilt! 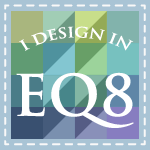 You must feel like you're on a bit of a roll with I'm guessing your quiltcon finishes as well.